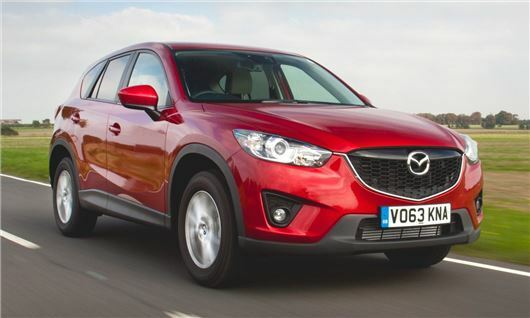 UK Car Discount has launched a new range of deals on new, 63-plate Mazda CX-5s. Offering savings of up to £2600, UK Car Discount has a large range of new CX-5s available as 1st registered keeper and each car includes free floor mats and transported delivery. SE-L Model Equipment and Features: Cruise control, push start button, front and rear electric windows, air con, auto dimming rear view mirror, karakuri tonneau cover, rear Seat 40:20:40 Split, rear seat fold flat karakuri functionality, daytime running lights, dusk sensing lights, front fog lights, front and rear parking sensors, power folding heated door mirrors, 6 speaker Radio/CD player with AUX, USB and Bluetooth support, leather steering wheel with audio mounted controls, 5,8 inch colour touchscreen, media commander, trip computer, driver seat lumbar, recline and height adjustment, iStop, sat-nav (nav models only). SE-L Model Safety Features:Curtain airbags, front driver and passenger airbags, front side airbags, passenger airbag cut-off switch, dynamic stability control (DSC) with traction control system (TCS), emergency stop signalling system (ESS), hill-hold assist, smart city brake support (SCBS), tyre pressure monitoring system, thatcham cat 1 alarm and immobiliser, ISOFIX child seat anchor points. SE-L Lux Adds The Following To the SE-L Model: Power tilt and slide sunroof, 6-way driver's seat power adjustment, leather trim seats, heated front seats and leather gear knob. Sport Model Adds: Smart keyless entry, bi-xenon headlights with adaptive front lighting system (AFS), reversing camera, 6-way driver’s seat power adjustment, premium Bose® surround sound system with eleven speakers, heated front seats, leather trim seats and sliding centre armrest. To browse a full list of Mazda CX-5 deals visit UK Car Discount or call 0161 946 3500.